The longest "blood moon" eclipse this century dazzled skygazers across the globe on Friday, coinciding with Mars' closest approach in 15 years in a thrilling celestial spectacle. 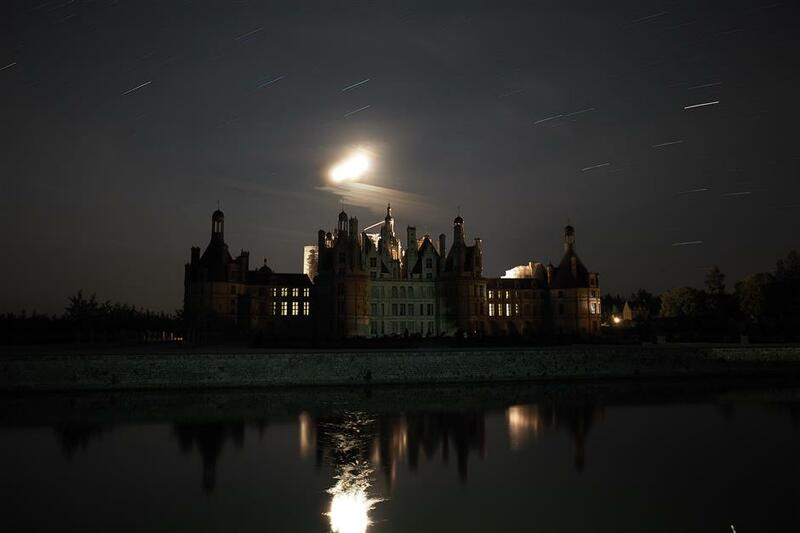 A "blood moon" eclipse and stars are seen over the roof of the Chambord Castle in Chambord, France, on July 27, 2018. As Earth's constant companion slowly sailed across the skies, crowds gathered around the world to catch a glimpse of the rare phenomenon. Beside Lake Magadi, 100 kilometers (60 miles) southwest of the Kenyan capital Nairobi, young members of the Maasai community watched the eclipse through a high-powered telescope provided by a local couple. "Until today I thought Mars, Jupiter and the other planets were in the imagination of scientists," Purity Sailepo, 16, told AFP. "But now I've seen it I can believe it and I want to be an astronomer to tell other people." Unlike with a solar eclipse, viewers did not need protective eye gear to observe the rare display. For about half the world, the moon was partly or fully in Earth's shadow from 1714 to 2328 GMT — six hours and 14 minutes in all. The period of complete eclipse — known as "totality," when the moon appears darkest — lasted from 1930 to 2113 GMT. At the same time, Mars hovered near the moon in the night sky, easily visible to the naked eye. Amateur astronomers in the southern hemisphere were best-placed to witness the rare sight, especially in southern Africa, Australia, and Madagascar, though it was also visible in Europe, South Asia and South America. More than 2,000 people including many children armed with binoculars gathered in the Tunisian capital of Tunis. "I hope this eclipse will bring us happiness and peace," said Karima, 46, without taking her eyes off the sky. However, bad weather thwarted the cosmic display in several parts of the world. Similarly, eager observers who had assembled on cliffs and beaches in the English county of Dorset were left in the dark due to an overcast sky. "It's disappointing," Tish Adams, 67, told AFP. "I took a few photos but there was nothing but a streak of pink in the sky." Those gathered in Brazil's Rio de Janeiro had more luck, snapping the red moon in the clear night sky with their phones and cameras. "I thought it was very pretty and I liked the planet Mars even more, which you could see right next to the moon," said Talita Oliveira, 34. 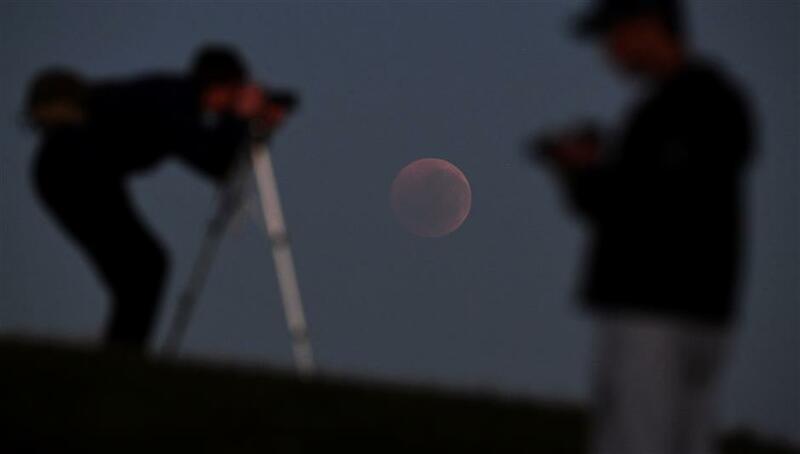 People gather to watch a "blood moon" eclipse in Melbourne on July 28, 2018. Mars appeared unusually large and bright, a mere 57.7 million kilometers (35.9 million miles) from Earth on its elliptical orbit around the sun. The moon travels to a similar position every month, but the tilt of its orbit means it normally passes above or below the Earth's shadow -- so most months we have a full moon without an eclipse. When the three celestial bodies are perfectly lined up, however, the Earth's atmosphere scatters blue light from the sun while refracting or bending red light onto the moon, usually giving it a rosy blush. This is what gives the phenomenon the name "blood moon," though Mark Bailey of the Armagh Observatory in Northern Ireland said the colour can vary greatly. It depends partly on "how cloudy or transparent those parts of the Earth's atmosphere are which enable sunlight to reach the moon," he told AFP. "During a very dark eclipse the moon may be almost invisible." The long duration of this eclipse is partly due to the fact that the moon will make a near-central passage through Earth's umbra -- the darkest, most central part of the shadow.